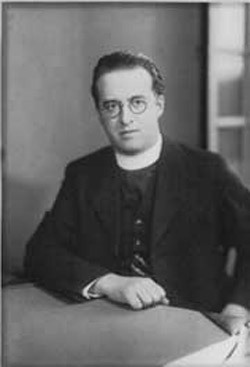 Georges Lemaître was a Belgian cosmologist and priest who was the original proponent of what later became known as the Big Bang theory. Trained as a civil engineer, he served as an artillery officer with the Belgian army during World War I, then, in 1920, he entered a seminary, where he was ordained a priest. From 1923 to 1924 he visited the University of Cambridge to study solar physics and there met Arthur Eddington; he then spent two years at the Massachusetts Institute of Technology where he was influenced by the ideas of Edwin Hubble and Harlow Shapley regarding the likelihood of an expanding universe. In 1927 he returned to Belgium and was made professor of astrophysics at the University of Louvain. In 1933 he published his Discussion on the Evolution of the Universe, in which he suggested that the universe stemmed from what he called a "primeval atom." This incredibly dense initial form, he argued, contained all the material for the universe in a sphere about 30 times larger than the Sun. Its explosion sent matter flying all directions and resulted ultimately in the expansion of the galaxies that we see today. The significance of his theory lay not so much in its affirmation of the expansion of the universe as in its presumption of an initial event to start the expansion. In 1946, Lemaître published his Hypothesis of the Primal Atom – the same year in which George Gamow and his colleagues began to develop the nuclear physics of the Big Bang.